21st Century's Herbal Slimming Tea is a blend of 100% natural herbs which provides a light, delicious caffeine-free beverage that helps achieve results in aiding digestion and contributing to weight loss. This all-natural herbal tea offers a rich, satisfying taste in hot or iced tea and provides slimming and digestive benefits that may be enjoyed after every meal. Drink Anytime – Hot Or Cold & See Results! Steep one tea bag in a cup of boiling water for 2–5 minutes to desired strength and taste. Drink 15 minutes before or during meals. If desired, add sugar or sweetener to taste. Begin drinking at half strength by diluting with water and reducing the steeping time. Gradually increase the tea strength as your digestive system adjusts. I have used this tea for several years and I am very pleased with the tea and the effects it had on me. This tea is really good and works good. I use the tea after work to help loose weight. You should also work out and run to help speed up metabolism just like any diet. You have to put effort in it for this product to work. I have lost 20 lbs so far. I started using this tea on saturday and the first few days were hard because I had loose stools. On the fourth day I weighed myself again and I have already lost 5 lbs. I didn't believe it. I am always iffy about weight loss products but this one really worked. 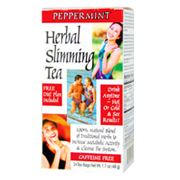 Slimming Tea Peppermint is shipped in a discrete, unmarked package. Orders are processed immediately and usually take about 3 to 5 working days to be received. We do ask that you try it for 2 to 3 weeks to feel the full effects. Any information received is used only for order processing and shipping purposes. Your information, such as e-mail address, will never be disclosed to a third party.